With the world on the brink of war, troubled teen Daisy (Saoirse Ronan) leaves America to stay with relatives in rural southern England. The crumbling manor in which she sojourns is a world away from the shadow of impending conflict, with Daisy’s cousins Issac (Tom Holland) and Piper (Hayley Bird) living a carefree existence under the watch of brooding older-brother Edmond (George MacKay). Daisy’s relationship with Edmond deepens as he shows her a world where freedom matters more than control. The detonation of a nuclear device in London cuts this idyllic existence short. Separated from Edmond, Daisy is determined to return home. As this plot summary shows, How I Live Now is high concept stuff. Combining elements of the teen film with a post-apocalyptic setting (or more properly, apocalyptic), the film presents itself as something like John Hughes meets 28 Days Later (2002). This is certainly the strategy adopted in the film's wonderful tone-shifting trailer, but the film offers so much more than a glib genre experiment. It makes its various genres work hard, each having a part to play in sketching out the broad themes of freedom, control, love, and risk. If it’s wrong to think of the film as an exploitative genre mash-up, it’s equally fallacious to dismiss it as a stilted experiment in form. How I Live Now has a striking immediacy and beauty. Daisy’s arrival at the airport, for example, is a fractured and punky overture to the film, setting up the character every bit as effectively as Benjamin introduction in The Graduate (1967). The film makes fantastic use of music throughout, and the first half of the film is truly invigorating. The cinematography is also wonderfully evocative, all snatched fragments of beautiful moments: a wisp of sunkissed hair caught in the wind, the texture of a borrowed jumper, a kiss by firelight - the film is a haptic delight. In the second half of the film, the composition opens out to reveal a harsh and unforgiving landscape, with exquisite golds and greens giving way to a cold grey world. Key to the film’s success, however, is Ronan. A consistently interesting actress, here she delivers a star turn that leaves her co-stars in the shade. Many of Ronan’s previous roles have required qualities of otherworldliness or timelessness, and whilst she excels in these roles it’s really satisfying to see her get the chance to play a character who’s a normal young adult rather than an alien, vampire, ghost, or genetically modified child assassin - albeit a normal young adult dealing with extraordinary circumstances. Certain scenes are punctuated by Daisy’s multi-layered interior monologue, a stylistic tick that could easily become irritating in the hands of lesser actor. Ronan’s presence and intensity ensures this is never the case. MacKay’s Edmond is a symphony in straight-legged jeans and simple knitwear, and he has a blankness not entirely suited to his role as sensitive yet rugged outdoors type. Much of his appeal, however, comes from the ways in which he is looked at by Daisy, the emotions he stirs in her rather than those he has himself. 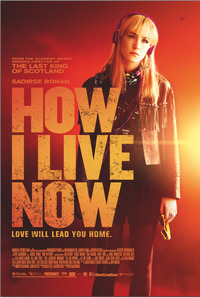 How I Live Now is a wonderful, sensuous film, one which should cement Saoirse Ronan’s reputation as a talented and captivating lead.